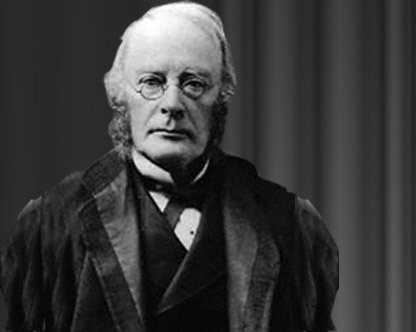 Samuel Ferguson was born in 1810 in Belfast, where he was educated at the Belfast Academical Institution. He studied law at Lincoln's Inn in London from 1831, and attended Trinity College, Dublin from 1834, though his studies were interrupted by ill health. He was called to the Irish bar in 1838. Though from a landowning background his family’s fortunes were in decline and writing was necessary to him. His early publications were in the Belfast monthly ‘Ulster Magazine’ in 1830, but his first recognition came with the publication of poems in Blackwood's ‘Edinburgh Magazine’ (1832). Among these was ‘The Forging of the Anchor’ which is notable for its celebration of industrial work. Soon after this Ferguson became a regular contributor to the newly-established ‘Dublin University Magazine’. His lengthy review of James Hardiman’s ‘Irish Minstrelsy’ (1831), an anthology of old Irish songs and their English translations, not only protested at the quality of the translation but also challenged the idea that such material belonged exclusively to those of a Catholic and Nationalist background. Ferguson had by this time begun to study Irish with friends and, with the early history of Ulster as an imaginative resource, had formed his ‘ambition to raise the native elements of Irish History to a dignified level … the key to almost all the literary work of my subsequent life.’ Although his legal career, largely on the North-east circuit, took much of his time in the 1840s, he still published in journals and his work appeared in anthologies such as Gavan Duffy’s ‘The Ballad Poetry of Ireland’ (1845). In 1846, again recovering from illness, he travelled widely in continental Europe visiting libraries and sites of antiquarian interest. By this time he was associated with the Young Ireland movement and wrote an elegy for Thomas Davis which looked to a future Ireland that would be, ‘Self-respecting, self-relying, self-advancing’, though this could be ‘In union or in severance’. After his marriage – his wife, Mary Catherine Ferguson, was also a writer on Irish subjects – Ferguson’s activities outside his legal career were almost exclusively literary and antiquarian rather than political. The work of scholars associated with the Ordnance Survey, such as John O’Donovan, provided the basis for Ferguson’s increasing interest in verse narrative. The results of this were gathered in his first book, ‘Lays of the Western Gael’ (1865). In 1867 he became the first Deputy Keeper of the Records in Ireland, a post well suited to his scholarly interests, in which he remained for the rest of his life. He also continued to contribute to the Royal Irish Academy and was elected its President in 1881, having been knighted in 1878. He died in 1886 and is buried in Donegore in Co. Antrim. The manuscripts here are a product of Ferguson’s interest in verse narrative. His verse epic Congal (1872) was based on the old Irish prose text ‘The Banquet of Dun na nGedh and the Battle of Magh Rath’ (1842), edited and translated by John O'Donovan. This was followed by Conary and Deirdre which both appeared in his ‘Poems’ of 1880. These two works are considered to be among his finest verse narratives and are both derived from old Irish sources.